The first because it was a benefit reading for The New Group. Announced just a few days before I left, and in a wildly reckless scramble for tickets I booked. A scramble from the plane, to hotel and train later was I have to say, 100% worth it. This was one of those New York Theatre nights you get once a decade, and usually by accident. 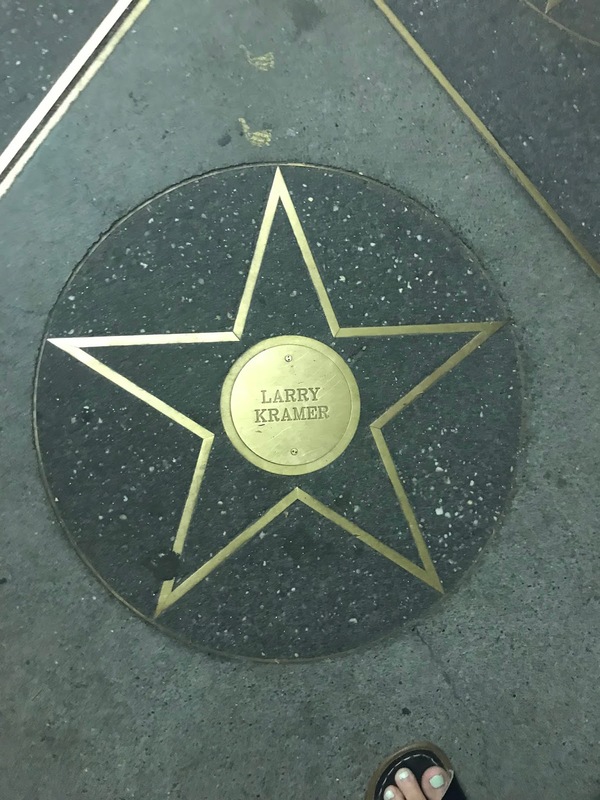 For those who maybe stumble onto this blog for this post, Kramer’s work is both very significant in my professional life and linked to the reason for this trip. I wrote my PhD on theatrical responses to HIV/AIDS, and had followed ‘my’ Angels (in America) to their new home on Broadway as part of the research for my book on the play. 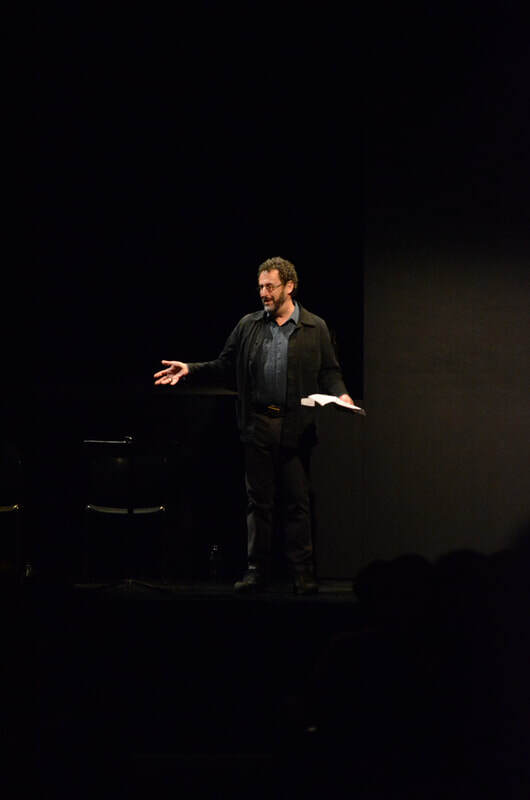 How then could I miss a chance to see Kramer’s play, starring an actor from Angels, and introduced by Tony Kushner? Larry Kramer’s less known, lesser performed sequel to The Normal Heart would be a rare treat any time. 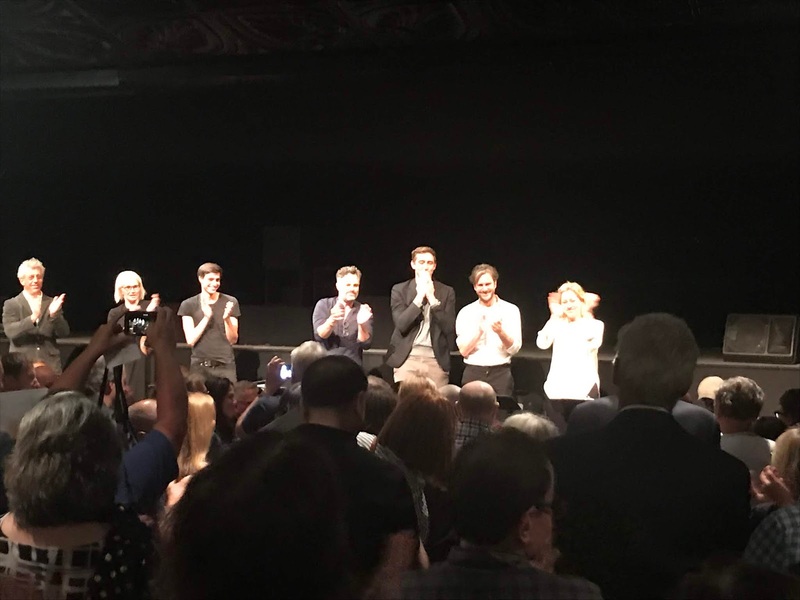 The cast assembled for the benefit however made it even more so. Led by Mark Ruffalo, who starred as Ned in the film (which I realise as I wrote this I saw exactly 4 years ago for the first time). 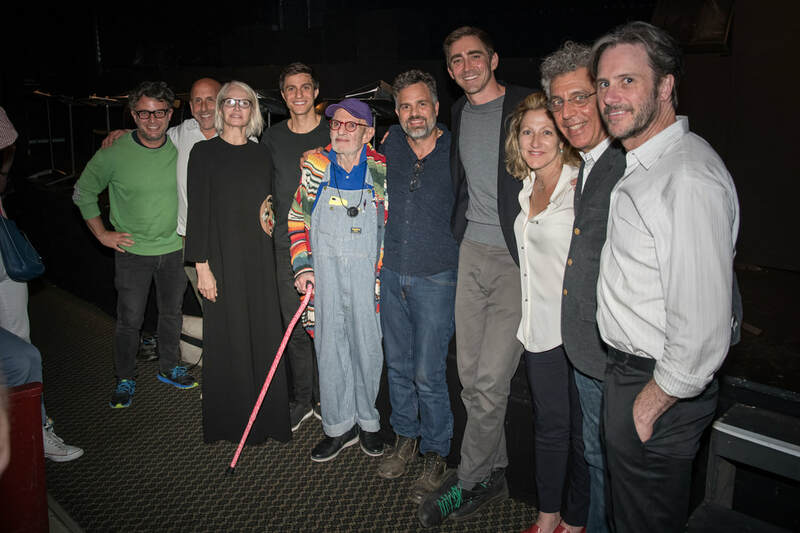 Alongside Gideon Glick as young Ned, Lee Pace as Benjamin, Ellen Barkin as Rena Weeks, Eric Bogosian as Richard Weeks and Josh Hamilton as Dr Anthony Della Vida. 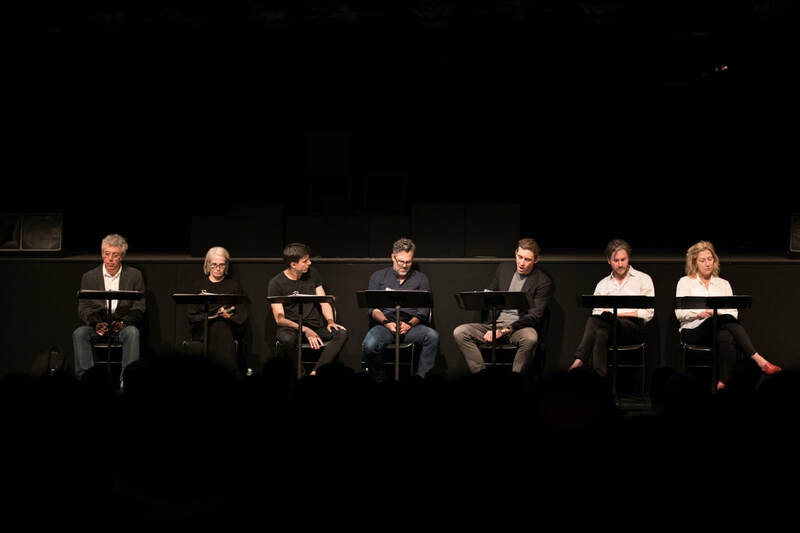 Even in a reading situation, the greatness of the play shines through. It’s a long play as Tony Kushner joked (pot, kettle black and all), albeit one with some cuts now. While The Normal Heart focuses on Ned Weeks at the centre of the AIDS crisis, his family background and what made him the man he was seeps into that narrative. The Destiny of me flips that, with Ned grappling with the AIDS crisis- and his own illness- forming the backdrop to the story of his family, and how he became that man. Told through Young Ned talking to present day Ned, we see back to his teenage years, sexual discovery and realtionship with his Father, Mother and Brother. The overbearing nature of his Mother, distance and difficulty of his Father and the seeming ‘Perfection’ of his older brother Benjamin. Ned’s struggles with himself, and his family are interjected by his current reality, doing battle with his illness, and mourning the loss of his friends. It’s a clever play that shows off Kramer’s narrative and theatrical talent. While The Normal Heart is it’s own work of genius, that is a play borne of anger and fire, written quickly in respose to crisis. That anger and fire is it’s power, it’s honesty and what makes it the rallying cry that endures. 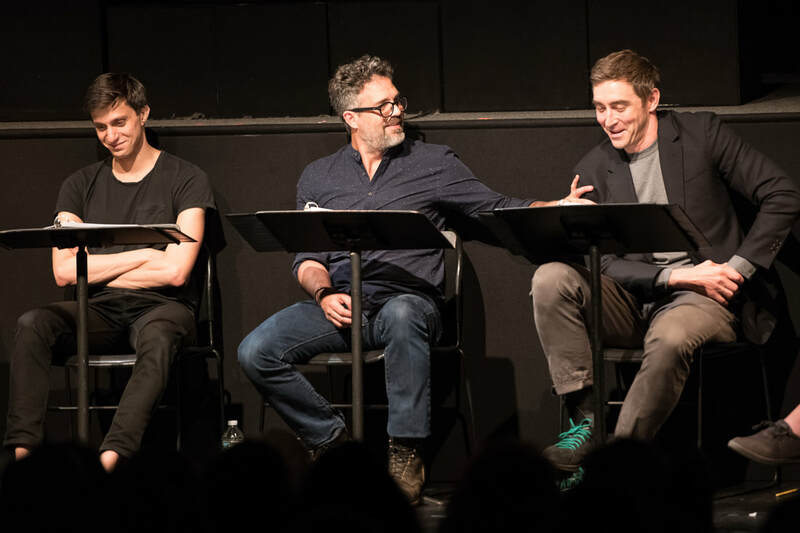 The Destiny of me is a more refined play, it’s a less urgent play, it’s the reflection Ned and Kramer weren’t sure they would get. In addressing the Epidemic, it’s a moment of stock taking- written in a moment where things were improving, but at a point when all those losses were still raw, still continued, and before treatment, and longevity could be assured. The anger is there, but its tempered by time, questioning and mourning instead of shouting. The family element is a cleverly crafted piece of writing, that shows off Kramer’s talent. Imaginative but with brutal honesty. Ned asks the questions of his family most dare not, and they answer him with equal clarity. Meanwhile ‘The Neds’ showed a clever through line in their younger/older selves. Young Ned being charming, effervescent and full of life (and showtunes), morphs into to grumpy, scruffy in voice and demeanor interpretation by Mark Ruffalo. But even in a reading the actors brought together mannerisms, ways of speaking that showed the younger Ned in older, and Older in Younger. 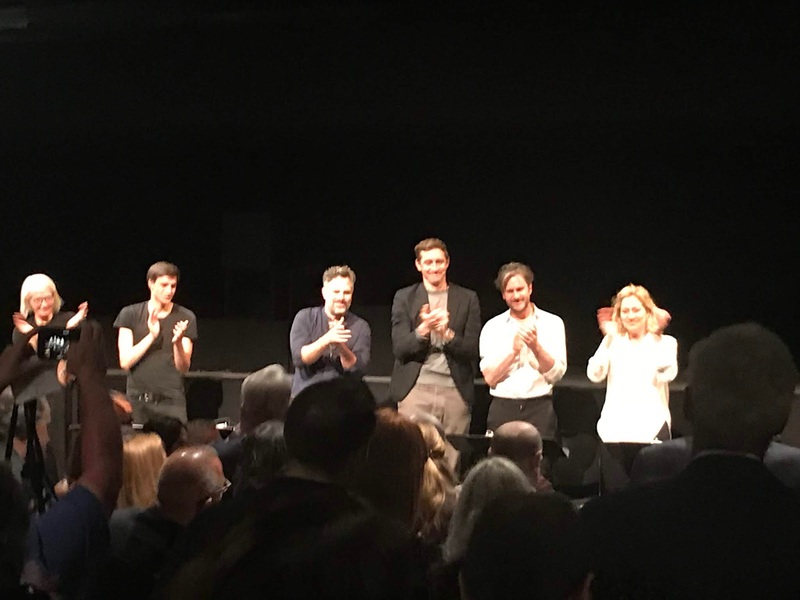 Cleverly performed, particularly with little rehearsal, they were in sync throughout and held together the play’s central conceit of these two part of the same man-and the differences in him. The use of showtunes, by young Ned, was funny and charming shifting to devastating when older Ned joins in. And something in the purity of Glick’s beautiful voice, against the harsh, unrefined tones of Ruffalo’s singing made that moment all the more magical, and tragic. 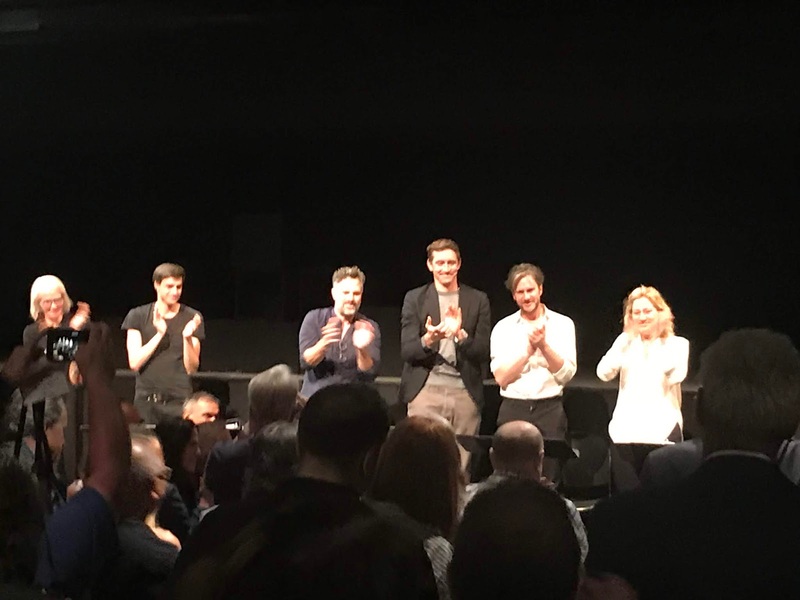 This reading was a rare (especially for a Brit) opportunity to see this rarely performed play. The fact Kramer has done re-writes gives me hope there will be a production somewhere, sometime in the future. 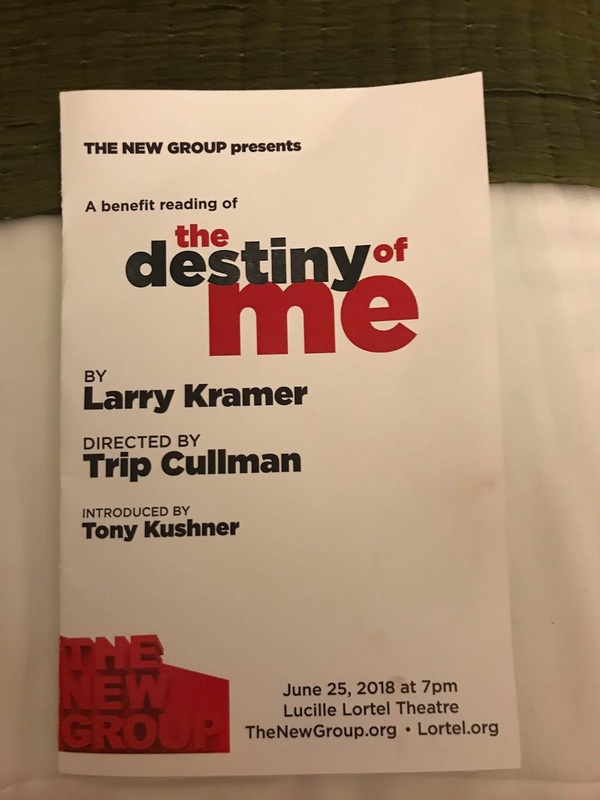 Taking a lead from his fellow traveler Kushner, I’d suggest making a day of it, and doing both The Normal Heart and The Destiny of Me in Rep. after all as Kramer apparently protested when told his play was too long, if Tony can have 7.5 hours…. Seeing the play was one highlight. But I cannot write this without talking about the others. 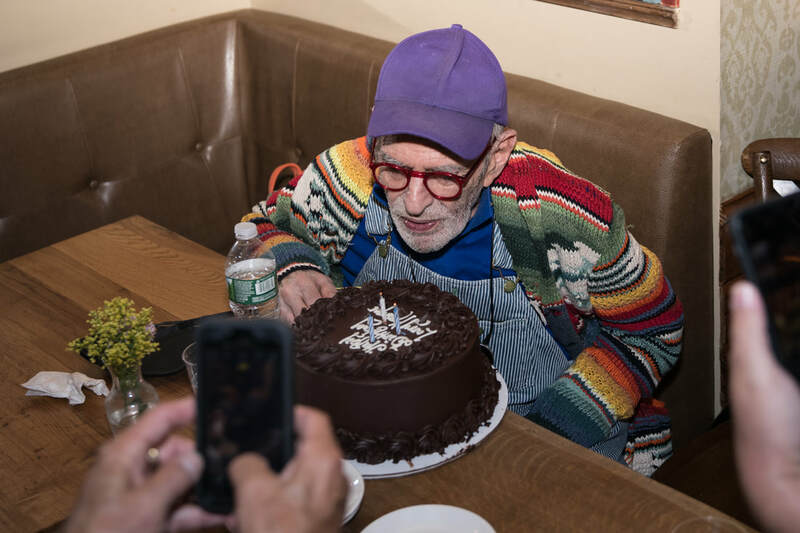 Being in the room with Larry Kramer was itself enough. As I said above, I’d flown that morning from London, got off the plane dumped my bags and hurried across New York. I got lost on the way home. It was a nightmare. It was a stupid idea. I’d do it all again. Kramer’s work has been a force of nature in my life. A guiding force, and something that gives me a much needed kick up the arse many a time. If Larry wrote this in the midst of the worst experiences anyone could have in life, if Larry can do all he did for the community, then I too can get up and keep working. I’ve spend years reading about him, reading his work. Being inspired by him. My second biggest argument in my PhD was because they made me cut the chapters on The Normal Heart (the biggest was about Foucault, the third about War Horse for anyone keeping score). I walked into the theatre and saw Larry just standing there. I live in Wales, I never thought I’d stand in a room with Larry Kramer. To see him, alive and well, ready to hear his play. That, was something. 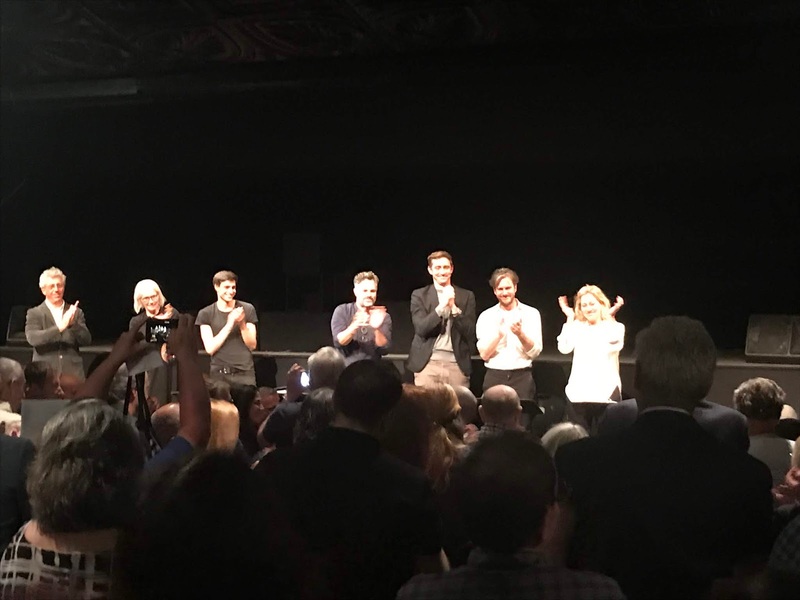 To sit and listen to Tony Kushner (whose play, we may remember I was crossing an ocean to see, again) talk about this play, what Larry has done and achieved. To be in that room. That doesn’t happen to kids from Wales who never grew up knowing what theatre was. Who were barely allowed to know what gay people were. And it was his Birthday. 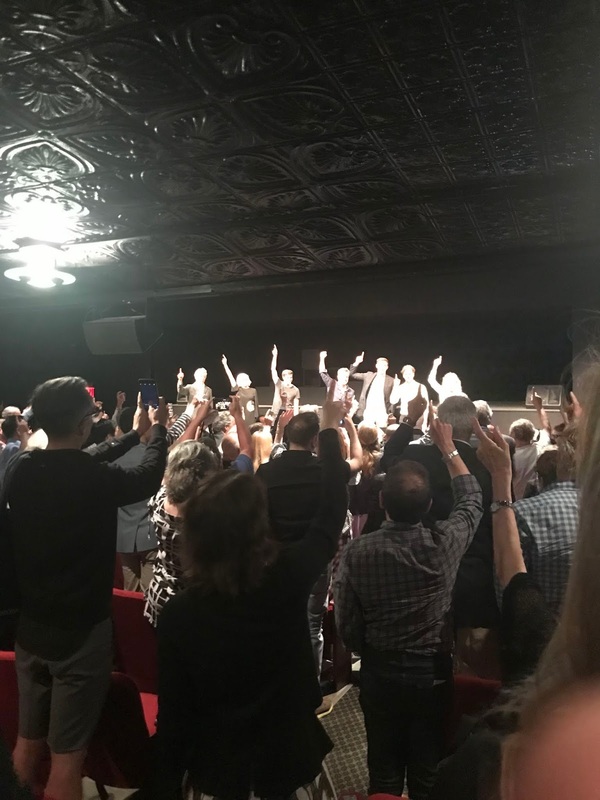 To sit in a theatre, in New York, and sing Happy Birthday to Larry Kramer on his 83rd Birthday. Because my work, my research and my passions had somehow conspired to bring me there. It was special. The coming blogs about this trip detail how emotional, important, significant etc etc it was for me. That it started out this way is an indication of what the whole trip meant. And maybe it won’t make sense to a lot of people. And I’m making sense of what it all means, really and maybe it makes no sense to most people. But I’ve worked on some of this research for nearly 10 years. I’ve been passionate about most of these plays, these writers for longer. I’ve grown up with them, and they’re a part of me. So this slightly foolish decision to rush from JFK…it was important. And it started a week of poignant moments for me. So thank you, to the New Group, for making a little nerd, who grew up a bigger nerd, who crossed an ocean, really happy.